Designed to support distances up to 300 metres, the DEM-431XT is a high performance 850nm Multi-Mode SFP+ transceiver. Supporting Full-duplex, 10 Gigabit speeds on Multi-Mode fibre cables. The DEM-431XT is 802.3ae 10GBASE-SR compliant and supports Full-duplex 802.3x Flow control. The DEM-431XT provides the necessary signal amplification for data to be transmitted to the network cable from the port, and vice versa. D-Link’s 10G SFP+ Module series are hot-swappable SFP+ transceivers that plug into SFP+ slots on switches and support 10G Ethernet. 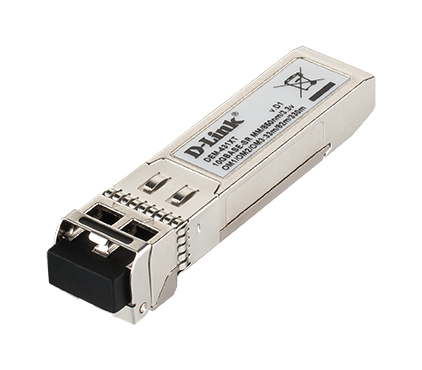 The D-Link 10GBASE SFP+ Module Series transceivers offer customers a wide variety of 10G Ethernet connectivity options for data centers, enterprise wiring closets, and service provider transport applications. The transceivers use the Enhanced Small Formfactor Pluggable format (SFP+). The SFP+ form factor is smaller than other form factors such as Xenpak, X2, and 10G XFP, ensuring lower costs, lower power disruption, and higher port density. They provide the necessary signal amplification for data to be transmitted to the network cable from the port, and vice versa, for the port to receive data from the network cable. All D-Link transceivers are hot-pluggable. You can connect a transceiver while the system is powered on without causing any problems. This permits modules to be added or removed without interrupting the network. The transceivers all support 10G Ethernet, which results in very fast data transmissions of up to 10 Gbit/s. This is 10 times faster than Gigabit Ethernet and enables the switch to handle faster and higher data transmissions, making it very suitable for business needs.